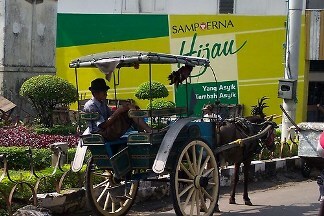 Jogjakarta, or Daerah Istimewa Yogyakarta (DIY) is a special district of Central Java. This is the smallest province of Indonesia with an area of 3169 square km. This city is an interesting place with friendly people and excellent choice of losmen and restaurants. If you want to experience the old city of Java, this is the place you have to be. You can enjoy the old time here, in Indonesian we say “DJaman Tempo Doeloe”. This is a big city but the pace is much slower than any other big Indonesian cities. Because of that Jogjakarta is favorite among the tourist, they come to this city not only because the atrractive Prambanan or the magnetism of Borobudur, but also for the city itself. You will find out that this city the cultural centers of Java is with major craft center and the best batik paintings of the whole Java. The city is full of bicycle and you can walk around without too much trouble. The traffic is not terrible like any other large cities of Indonesia, it makes pleasant place to enjoy by walking. Or hire a horse drawn dokar around the town. There are plenty and a fine way to enjoy the city. And if you’re in this town, don’t forget to taste the original dish of Jogja, Gudeg. The best place to get this dish. Sweet and tasteful. You can get this dish in an old fashioned woven basket. It’s lovely. There are nowhere in Indonesia where you can get this dish in this woven basket except here. So don’t miss out the opportunity to taste the best gudeg dish of Indonesia. 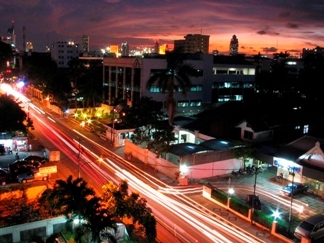 Jalan Malioboro is the centre of city. The main street where all action happened. Where kilometers of stalls and market that open in the early morning and in the evening turn into night market. The busy main shopping center. There are numerous restaurants, colorful bazaar of bookshops, souvenir shops, anything you will find here. And if you want to buy some souvenir for your friends or your family, this is the right place. The price is much cheaper than Jakarta, but bargain well and you might be get a quality product with good price. I would say this street is a must if you visit Jogjakarta. From Malioboro, if you walking about 20 minutes you will pass the kraton area, the old city of Yogya with lovely building, once the palace of Sultan Yogya. 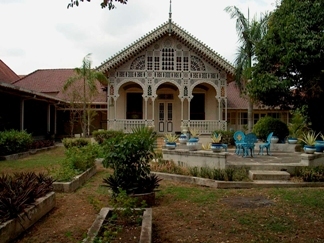 This is one of the finest examples of Javanese architecture with decorated roofs , spacious courtyard and pavilions. The large parts of this building is used as a museum. The museum is closed on national and kraton holidays. If they’re open you can enjoy the collection of the museum like gamelan instruments, the golden copies of the sacred pusaka, royal wedding carriages. It’s just lovely to see all of them. It’s worth of visit. 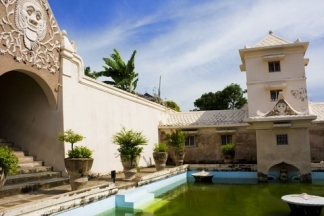 To the west side of Kraton, you will find the Taman Sari Palace or the water castle. The place was once the pleasure park for the sultans of Yogya with pools and waterways. The castle was damaged by the Java’s war during the of Prince of Diponegoro, the hero of many Javanese. And the earthquake in 1865, make this place completely destroyed. The place is now recovered. You can still enjoy the place. There are small houses and batik galleries. As you already know, this city is not far from the greatest attraction of Indonesia, Borobudur temple on the north east of the town. It’s also the reason why many people from the whole world come to Indonesia. To the north East of the town, you’ll find Prambanan temple, the biggest Hindu temple of Java. Enough visited temples? Why don't you try the Parangtritis beach near this city to refresh you up? So Jogjakarta is a lovely town to visit, friendly people, delicious dishes, numerous great attractions. A town that you can easily to fall in love.